On this day in 1945, Kim Malthe-Bruun was executed by firing squad in the Vestre Fængsel Prison in Copenhagen. 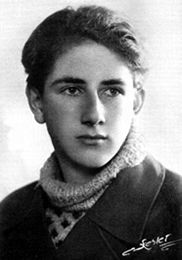 His crime was being a member of the Danish Resistance Movement in German-occupied Denmark; he had stolen a customs boat and used it to smuggle arms from Sweden to Denmark to be used against the Nazis. Kim was born in Saskatchewan, Canada in 1923, and moved to Denmark at the age of nine with his sister and mother. He quit school at seventeen to become a merchant seaman, then joined the Danish Resistance in 1944. Kim was arrested on December 19, 1944, held in various detention cells over the next few months, tortured, and condemned to die, along with three other members of his resistance group. Doubtless the Nazis were anxious to execute them all while they still could; Germany’s surrender was less than a month away. In 1949, Kim’s mother, Vibeke Malthe-Bruun, published a collection of his letters and diary entries. The book, titled Kim, became a bestseller in Denmark and made Kim revered as a national hero. It was published in English in 1955, under the title Heroic Heart: the Diary and Letters of Kim Malthe-Bruun. Most of the sources about him are in Danish. You see, Hanne, one day you will meet the man who will be your husband. The thought of me will flash through you, and you will perhaps deep down have a vague, uneasy feeling that you are betraying me or something in you which is pure and sacred. Lift up your head once more, Hanne, look straight into my eyes which are smiling at you and you will understand that the only way to betray me is by not completely following your natural instincts. When you see him, let your heart go out to meet him — not to drown your sorrow but because you truly love him. The author Lois Lowry was inspired by Kim’s story and based a character on him in her book Number the Stars. The novel, which is about the rescue of the Danish Jews, won the 1990 Newberry Medal, one of the most prestigious awards in children’s literature. I lived in Denmark and experienced the German occupation first hand in Copenhagen. My daughter – now 58 – was named Kim in honour of the man, the movement and the spirit. I remember him and “them” and the price they paid every day. is there any way i could contact you to hear of what you remember from that time as well as Kim himself? I love this letter I love the book number the stars I never took a lot of this seriously until are teacher told us stories about him and others. Now I understand fully the importance of this and no matter how you look at this it is wrong. God Bless him, God bless them all. Such a sad book!I’ve learned so much about this life back then and made me feel like pouring tears! The letter was great!He was so brave that time ! Hope so much for good life in heaven! Thanks to you Kim you were important and thanks to Lois Lowry for describing us so much secrets…. I too have read the number the stars book and it has made me very sad and thankful to people like Kim Malthe Bruun. I wish all people were as brave as Kim Malthe-Bruun was. He seems like such a brave caring person. Let us remember people like him always. This is soo sad.I have read the book Number The Stars,and that book was very good.I often think about all the people who have died fighting for something in which they believe in and thank them for their bravery and courage and let me tell you that Kim is one of these people indeed and the world would not be so much better today without them. Everyone needs to read and know this………a timeless truth and inspiration……..